The Due Date for Poster Submission for inclusion in the program book is June 1st, 2019. Posters will still be accepted until June 25th. These late posters will be added as a supplement to the program book and will be added to the archived (online) version of the program book. Submit your poster via the Poster Submission Form. 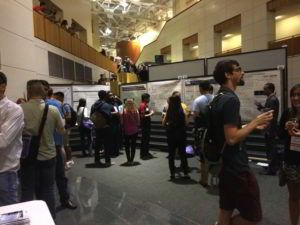 You do not need to be an Organic Division Member to submit a poster for presentation. If you have technical problems with your submission, use the Contact Us Form. Information on Travel Awards available to the NOS can be found on the Travel Award Page. The poster sessions will be held in Alumni Hall and the Solarium located in Indiana Memorial Union.